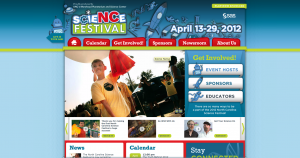 NC Science Festival Site Launch! The North Carolina Science Festival had its first run in September of 2010. It was so successful, they decided to do it again — this time bigger and better. As part of the initiative to make the event the best one yet, NCSF hired us to create an amazing, interactive website promoting the festival. And that’s exactly what we did. The new site is up and running after we launched it last week. We’re really excited and very proud of the work we’ve done. The NCSF 2012 site is interactive, making it easy for visitors to get information about the Festival and easy for organizers to post information, keeping it current. We constructed a plan to build the website in three phases. Phase One will focus on pre-festival activities, and will allow organizations to apply to host events, to increase Festival participation and to establish the site as a year-round destination with fresh, updated content. Closer to the Festival, the web site will switch to a Phase Two version, serving to promote the Festival Calendar and highlight specific Signature Events. Phase Three will focus on the post-festival wrap-up and highlight Signature Events with video, photos and written content. We just love working with the NCSF team, and we are all very excited for what’s to come! As always, we love feedback! Let us know what you think in the comments below or on Twitter @RiversAgency. We think it’s killer, of course! Thanks, Rivers Agency for developing our vision. The site looks great! I am very impressed!